As far as weather goes, May sucked. And June isn’t off to a very good start. It wasn’t just that it felt cold. 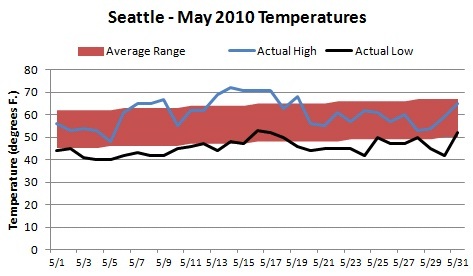 May’s temperatures were significantly lower than normal. In May, 21 of the 31 days had temperatures below the normal low. Only 9 days were above the average high. The temperature was in the 40s 25 of 31 days. 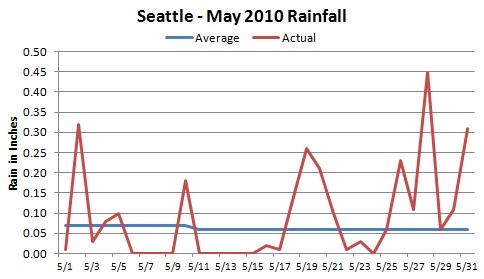 And it was a rainy month, with 21 days seeing some precipitation. Rainfall was 44% above normal – 2.8 inches versus the normal of 2.0 inches. April showers brought… May showers.